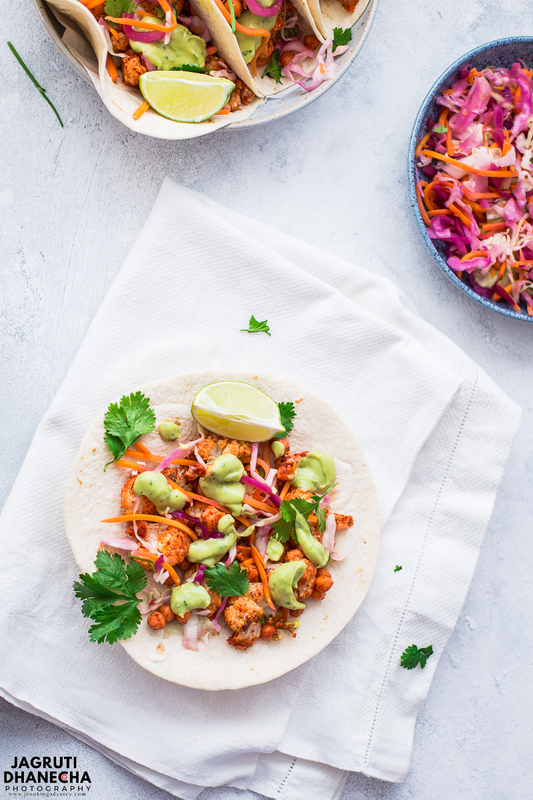 How to make Tandoori Cauliflower and Chickpea Taco | Tandoori Cauliflower and Chickpea Taco in a plain tortilla wrap with fresh avocado chutney. In this recipe, cauliflower florets and chickpeas are coated tangy tandoori marinated and baked until golden. Delicious and healthy! All Dairy-free, plant-based and vegan. Tandoori Cauliflower and Chickpea Taco are a perfect meal to spice up your lunch or dinner. They bring the flair of fusion cooking to your house. Think of a clear sunny sky, breezy back garden and a plate full of these tandoori cauliflower and chickpea taco, an ultimate summer dining experience. 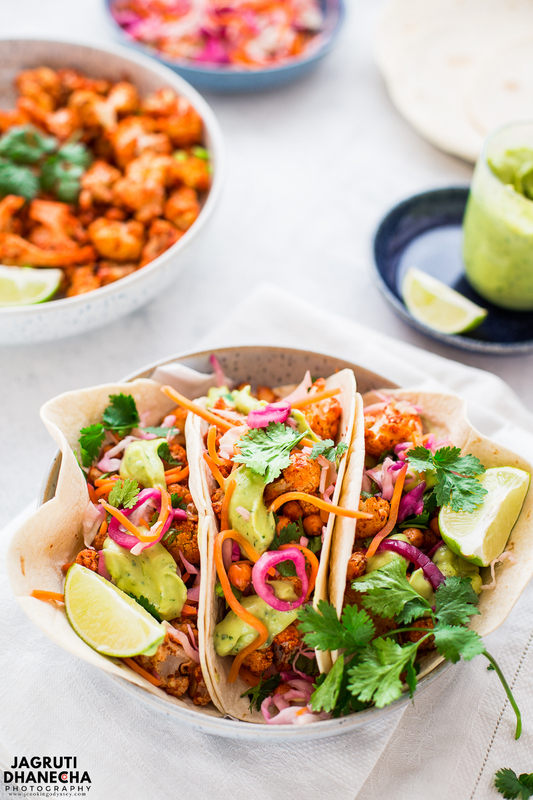 These easy fusion, spicy and vegan tacos are your new favourite way to enjoy cauliflower and tandoori dishes and that too perfect for a vegetarian main meal and students who are living on a budget. 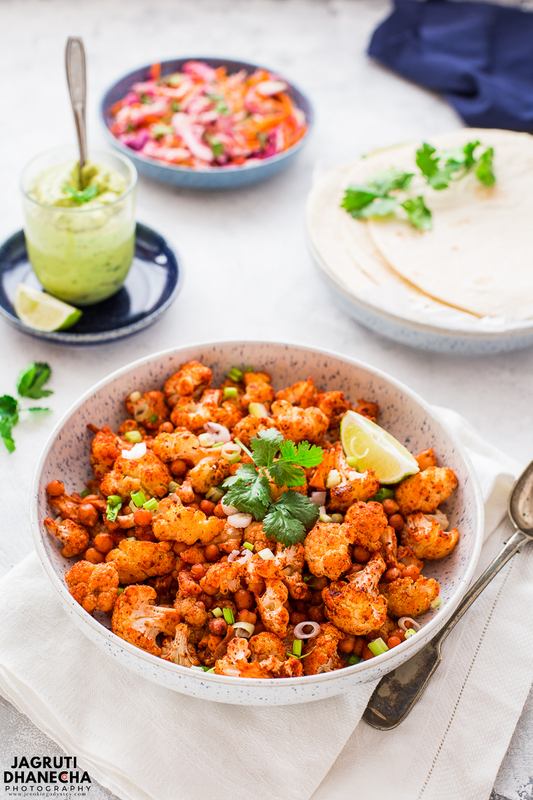 Crispy and flavourful tandoori cauliflower and chickpeas in warm tortillas with a creamy and spicy avocado chutney with pink slaw and fresh coriander leaves, sounds so exciting right? We are a huge fan of taco, whenever there is a warm weather and for me, it is very hard to stand in the kitchen to make full Indian meals, we opt out for al fresco meals where we can enjoy outdoor dining and weather. For us, this year summer was unbearable, scorching and humid weather was making me tired. 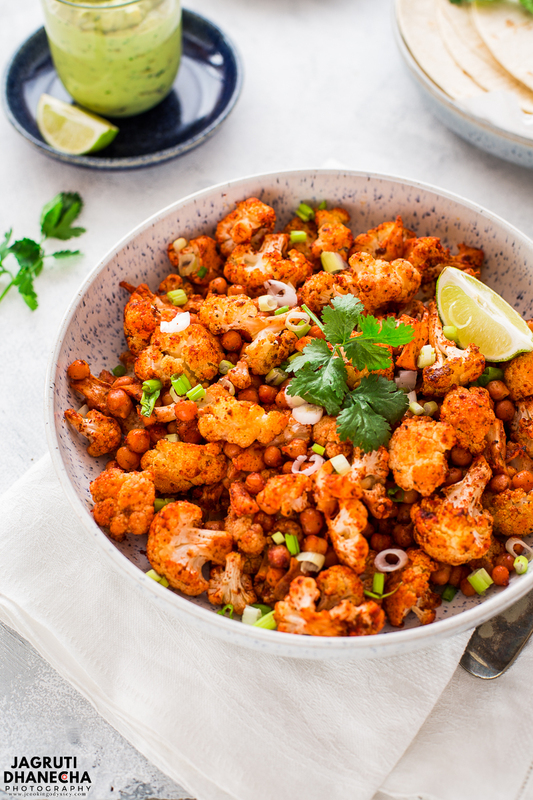 Every other day of the week I was skipping making full Indian dinner for the family, but that does not mean that my family would stay hungry or we go for a takeaway, instead, we would enjoy easy, simple but delicious and healthy meals like Tandoori cauliflower and Chickpea Taco. I just don't have to slave in the kitchen as I can cut up all the vegetables out in my back garden. And while they bake in the oven I would enjoy making avocado chutney and pink slaw which does not require any cooking after 30-40 minutes our meals are ready! Tacos Turned out exceptionally well- so colourful and with an explosion of taste with every bite. So much freshness going on- it's fun food, just relax and eat. How did I make Tandoori cauliflower and Chickpea Taco Vegan? Usually, tandoori marinate is made using yogurt, but I used dry mango powder and lemon juice and I bought vegan wraps. How can I make Cauliflower and Chickpea Taco under 45 minutes? Buy tortilla wraps and pink slaw from the store, instead of making at home. Use canned chickpeas. While cauliflower and chickpeas are baking in the oven for 30-35 minutes make the dressing or sauce. 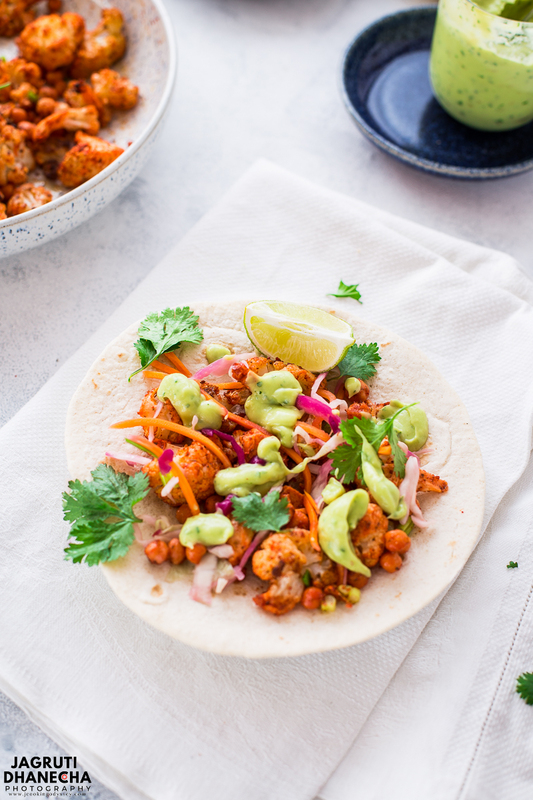 After 40 minutes you'll be rewarded with this ultimate Tandoori Cauliflower and Chickpea Taco with Avocado chutney. 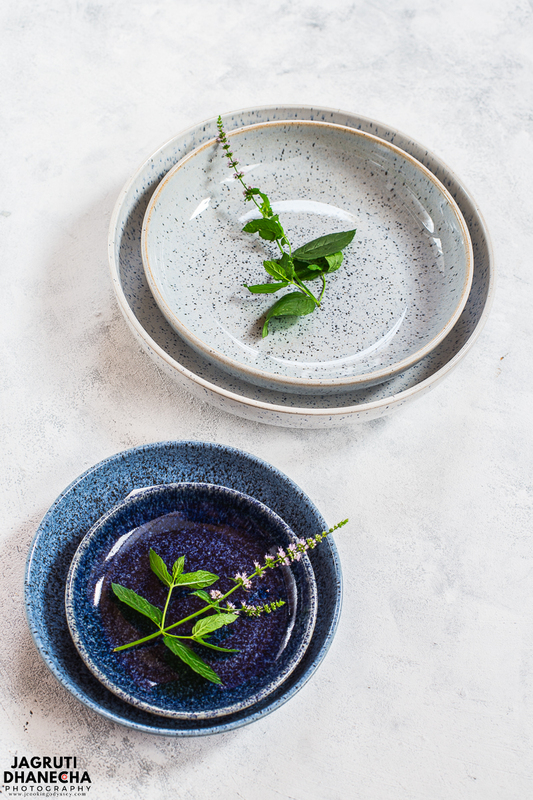 There is something about the appeal of a dish, it always looks and tastes better when it is served in beautiful tableware. The type of meal and setting heavily influences the type of tableware used. Recently, I was sent Nesting Bowls from the Studio Blue collection by Denby. Denby is a brand synonymous with Britain and with tableware so I was really happy to get the chance. 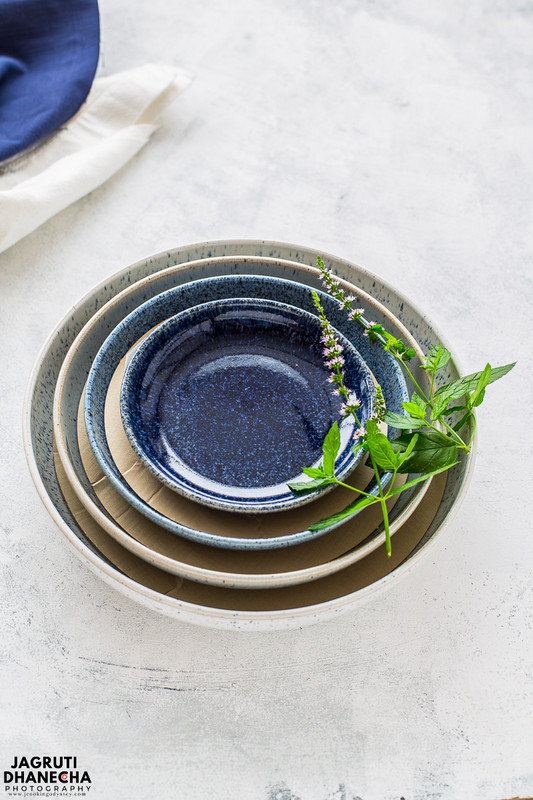 Denby has been leading in pottery - all of which have been made in the UK for over 200 years. The bowls were very stylishly packaged - they would be perfect as a gift! The bowls themselves are very beautiful - perfect but still rustic. And the colours are harmonious. I love the 4 different sizes for the bowls, ideal for serving a complete meal. They match perfectly with the summer season, with barbeques and get togethers but similarly would work fantastically in the cooler months. I can see myself cradling the bowl that's filled with hot stews! I'm looking forward to using them more and more in my kitchen. I recently came across an article about how different coloured foods look on different plates, for example, blue pairs well with yellow/orange foods. It is such a happy coincidence that curries are so often made in my home. I think I'll just keep the bowls out all of the time - no need to neatly and safely store them! As usual, my daughter has her eye on them too to take back to uni. Sorry Hayley, these ones are for mamma only! Tandoori Cauliflower and Chickpea Taco in a plain tortilla wrap with fresh avocado chutney. In a big bowl mix tandoori marinated ingredients. Add cauliflower and chickpea and gently mix until everything coats well. Transfer to the baking tray, do not overcrowd the baking tray. Bake for 30-35 minutes. Keep checking after 15-20 minutes so it doesn't get burn. Meanwhile, make avocado chutney by placing all the ingredients in a blender and blend it until smooth, if it is too thick add little water or orange juice. 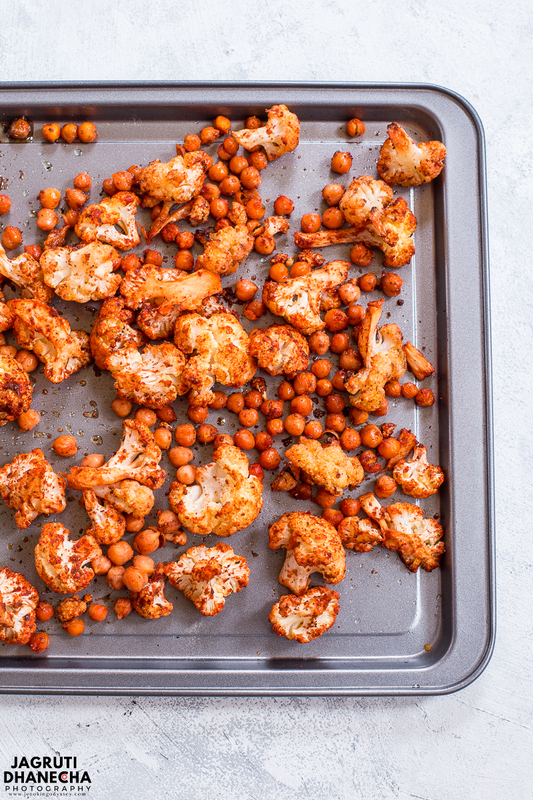 Once cauliflower and chickpeas are baked, remove the tray from the oven. Fill each tortilla with pink slaw and salad. Top with tandoori cauliflower and chickpeas and drizzle avocado chutney on top. Garnish it with freshly chopped coriander and serve with lime wedges. If can't find tandoori masala powder use any type of curry powder. Do not use frozen cauliflower, you won't get crispy bites. Use any type of salad. Corn tortillas can be used if plain tortillas not available. Disclaimer: Thank you, Denby, for sending me Studio Blue Nesting Bowls. I was sent this product for an unbiased review not paid or told to write a positive review. All opinions are my own. These bowls and tacos are stunning! Checking out the pottery site now and putting these tacos on my must make list soon!